A collection of Kimba music. Sing along with these musical selections! All these songs have a Play button, so that you can play them right here on this page. This is what everyone wants the most: the original, 1966 version of THE THEME SONG!! This is absolutely and positively the BEST, cleanest, and most complete copy of the theme to Kimba The White Lion that you will find ANYWHERE on the Internet! Written by Bill Giant, Bernie Baum, and Florence Kaye. And now for something just a little bit different. It's the OTHER 1966 THEME SONG! This was sometimes heard on U.S. TV, even though it's not on any home video, but I'm told that in some countries this was the way the Kimba theme was heard on all episodes. I FINALLY got my hands on a complete, unspliced 16mm print with this theme. Now you can enjoy it, too! Written by Bill Giant, Bernie Baum, and Florence Kaye. You may have noticed mention of the lost version of the first Kimba episode. Here is the reconstructed theme song for that episode. From a 1968 TV broadcast. Original music written by Isao Tomita. NEW! You could call this "Inside the Dubbers' Studio"--here is an early rough cut of this lost theme song, from an original Titan Productions studio reel tape. It appears that, for a while, the Americans were intent on adapting the Japanese theme and were trying different ways to cut it down from its original length to about 40 seconds. It's great music, but it would never have been as popular as the theme they finally came up with! Stereo. From the Wyncote album, TV '67. If you saw Kimba on TV recently, you might want this theme written in the early 90s for the current version of Kimba seen on TV in the U.S. and Europe. This is the same theme heard on the "Kimba The Lion Prince" home videos. Written by Paul Zaza and Yvonne Murray. From the first episode: the mice dance and party to celebrate Kimba's birth. Music written by Isao Tomita. Excerpt from the Kimba Symphonic Poem. Here is Kimba's mother appearing to him in the stars. This audio file is an experiment; the Japanese original is on the left side and the rare full English version is on the right side. I think it works. I can't listen to this unless I have some Kleenex handy. Music written by Isao Tomita. And learn to speak the human language! This is a combination of two performances of this song which was very important to the story. The lyrics are basically the Hiragana alphabet. Music written by Isao Tomita. There is a video file for this song on my video page but I could only fit part of the song in that file. This is too beautiful to keep from the world, so here is all of Kitty's Song in the original Japanese. Music written by Isao Tomita. Here it is in English. Voice of Sonia Owens as Kitty. Click here for the English lyrics. This is the Where Is My Baby song, from the episode "Scrambled Eggs". Music written by Isao Tomita, sung by Billie Lou Watt, Sonia Owens, and the rest of the original American cast. This is the tune Roger Ranger played on his flute, and which wafted on the breeze all over the jungle. Music written by Isao Tomita. Here is the Owls' Song from the episode "The Gigantic Grasshopper". This song is so perfect as it is, that it was never translated into English--it was left in its original Japanese in the American version of Kimba! Now you can hear it without the narration on top of it from the American version, and without the distortion that's in the Japanese DVDs. Music written by Isao Tomita. I don't know why I didn't think of adding this one sooner. EVERYBODY knows this sound! It's Kimba to the rescue! Music written by Isao Tomita. This link will give you the original theme written for the Japanese version of Kimba ("Janguru Taitei" or "Jungle Emperor"). You can hear this melody throughout the Kimba episodes, and now you know where it comes from. Music written by Isao Tomita. Bonus! Here's an alternate version of the theme, with lyrics. And big thanks to Alli Kat Nya for providing the lyrics, in both Japanese and English. Stereo. Bonus! Bonus! Variations on a theme: Here's a selection from one episode's soundtrack. If you like the theme song, you'll like this. Stereo. And this link will give you the closing theme for both Japanese series "Jungle Emperor" (Kimba) and "Onward, Leo" (Leo The Lion). The song is called simply, "Leo's Song" ("Leo no uta"). And thanks once again to Alli Kat Nya for providing the lyrics for this one, too, in both Japanese and English. It's a great song and a great singer, so I was happy to find this rarely-heard long version. Music written by Isao Tomita, lyrics by Masaki Tsuji. Sung by Mieko Hirota. This is another melody that you'll also hear used in various Kimba episodes. This melody was also used for the theme to Le Roi Leo (the French version of the Leo The Lion series--see below). Bonus! Variations on a theme: Here's a selection from one episode's soundtrack. If you like the ending theme song, you'll like this. Stereo. Bonus! Bonus! A simple, one-handed piano treatment of this theme, in MIDI format. Words and music by Toriro Miki, arranged by Isao Tomita. Wanna sing along (in Japanese)? RealVideo 5 file; 408 kbytes. From the Leo The Lion series, this is Lily's (the black leopard) favorite song. Leo likes it too. Hey, Leo! Music written by Isao Tomita. When Onward, Leo finally made it to the US, it became known as "Leo The Lion". Here are the themes--plural; there were different opening and closing themes--written in the 80s for the US version. The theme to Le Roi Leo (in French). Same melody as written by Isao Tomita for the original Japanese closing theme. This file is still not the highest fidelity, but I'm always on the lookout for improvements. This is the Kimba theme from Finland in the 1980s. And here's the lyrics in both Finnish and English. Thanks to Lauri Welling for the sound file and the lyrics. This German theme is from a record and it's a bit longer than what was heard on the air. It's so much fun, longer is definitely better! Here's the lyrics in both German and English. Many, many thanks to Joachim Rabus for translating them into English for me! You can find out much more about Kimba in Germany here: Kimba, der weisse Löwe. This Kimba song is from the first time Kimba was shown in Italy, around 1979. (There's also a newer Kimba theme song from a more recent showing, and it's right below this one.) It is sung by a group called I Cavalieri del Re (The King's Horsemen) and it was written by the lead singer of the group, Riccardo Zara. (Thanks to Arslan for that information!) And here's the lyrics in both Italian and English. Many, many thanks to Jim Caponetti for translating them into English for me! Here's the newer Italian Kimba theme song, from about 10 years ago. It was a TV series in which they played both original seasons of Kimba (Kimba + Leo the Lion) and the 1989 New Adventures series. Kimba's theme song, in Spanish! This is the same tune written by Bill Giant, Bernie Baum, and Florence Kaye for the English version, which means it comes from the first time Kimba was aired in Spanish. From Mendo_chan's former Kimba site. From Saudi Arabia, the theme for the second season of Kimba, aka Leo the Lion. Based on the Japanese end theme. You can see the video that goes with it here. This is the original Japanese theme song for "The NEW Adventures of Kimba", as it is known in the U.S. This 1989-1990 remake had some good things and some bad things. The theme song is one of the good things. "Special Edition" of this song, unique to this site. This is the ending theme song for the original Japanese version of "The NEW Adventures of Kimba". 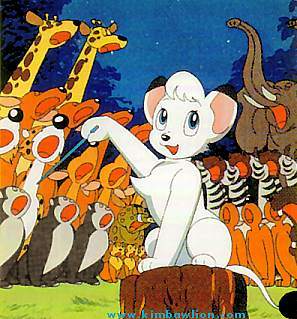 The animation accompanying this song featured super-cute versions of Kimba and Kitty, and had nothing to do with the story or anything else. But it's a nice song. This page changed September 29, 2011.